WA led from the start taking a half second lead from Queensland in the first 500 metres with Victoria in 3rd placing. WA strengthened their lead in the middle 1000 metres with Victoria taking second place from Queensland in the third 500 metres. The margins and placings did not change thereafter with WA winning comfortably by just over a length. The WA crew contained two very good Italian oarsmen who were temporarily resident in WA. The Victorian crew contained Olympic Champion Drew Ginn who was taking a year off competitive rowing and also the 2005 National Champion single sculling champion David Crawshay who chose to race the eight rather than the scull. The Queensland crew members were disappointed as they were trying to break the Queensland losing streak in this event. Queensland last won the King’s Cup in 1939. The sole survivor of that crew, Don Tynan, was a guest of the organizing committee to witness the race. Scott Brennan had a good start getting a 3.82 second lead in the first 500 metres. He then held onto this lead throughout the race to finish 3.74 seconds in front of the promising SA sculler David Morgan with Al Taylor from Victoria a further two seconds back. This race should be probably renamed the Tasmanian or Burgess Cup after the seventh win in a row to the Tasmanian crew with Simon Burgess being a member of all seven wins. This makes him probably the most prolific winner of the event. It was an all the way and comfortable win although the ACT crew tried to bridge the gap in the final stages of the race. The NSW crew was the fast starter and maintained the lead to the half way mark with the Tasmanians following. However the South Australians and Western Australians had plenty in the tank and rowed through during the second half of the race to take first and second placings with a margin between them of 0.7 second. The other crews were over a length behind. This was a great second half of the race with a superb finish. The Victorians dominated the event taking a three second lead in the first 500 metres and extending their lead in every part of the race thereafter to win by over 10 seconds. The only interest in the race was for the minor medals with a strong finishing WA nearly taking second placing. 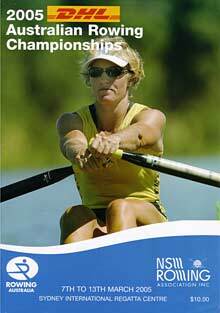 Danielle Jolly of NSW became the first rower to have raced in all of the Queens Cup, Nell Slatter Trophy and Victoria Cup. This was a great and tight win by the young Queensland sculler Sally Kehoe from her more experienced rival from Tasmania, Dana Faletic. Faletic led early only to have Kehoe take the lead in the second 500 metres. Faletic regained the lead in the third 500 metres only to lose it again in the last part of the race. It was a classic race and Kehoe will no doubt reappear on the record books in the future. This was a great race between the Victorian and Tasmania crews with the Victorians stealing the race in the finals stages after being in second place throughout the rest of the race. The winning crew had even suffered a last minute withdrawal of one crew member for medical reasons. The current champions from SA had all taken the year off after the 2004 Olympic Games and no crew was entered by that State. The Victorians and Queenslanders shared and changed the lead throughout the first three quarters of the race but the Victorians powered away to win by a length in the final stages of the race.